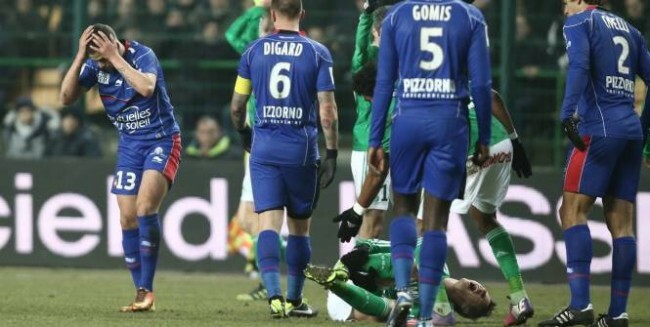 The LFP’s disciplinary committee have seen fit to suspend Nice midfielder Valentin Eysseric for a whopping 11 games – meaning the 20-year-old has, in effect, been banned for the rest of the season – after being red-carded for a horrific lunge last weekend which left St Etienne’s Jeremy Clement with a broken leg and several sheared ankle ligaments to boot. After receiving his punishment, Eysseric apologised unreservedly for his actions and confirmed he would not appeal the LFP’s sentence – presumably as, much like Clement, he wouldn’t have a leg to stand on. As a result of Eysseric’s challenge, Clement suffered a fractured tibula and has now been ruled out for “at least six months” after undergoing surgery earlier in the week. Eysseric actually apologized several times well before he was punished, including immediately after the match, when he was close to tears. He spoke with Clement shortly after his surgery, and just visited him in the hospital — they’re both handling a horrible situation with immense class. Apologetic or not, that’s a career threaten-er/ruiner. I’ve always been of the opinion that your ban should mimic the length of time out that the injured person has to have. Would’ve kept us from having to endure maniacs like roy keane, marco materazzi, et al. Not even close to the very famous Keane brainfart. To call that ‘very famous’ tackle (ie assault) a ‘brainfart’ dismisses any opinion you might have as credible on such matters. Couldn’t agree less. Some players can get injured and be out for months after a clean tackle. Others can be ok after awful challenges. Very poor challenge but you can’t start giving out bans in relation to injury times. What if the player comes back early? is the ban then lifted? and therefore if the player relapses does the players ban get increased? Not only that, like @Herman said, what about when someone makes a terrible tackle and the player is ok. Does this mean he has no ban at all? Think about what you are saying. Good points. I was thinking along the lines of when an injured player is out for 6+ months. Anyways, not gonna happen so why bother with all this!